During the summer months, the landscape on either side of the Mersey River in Kejimkujik National Park in Nova Scotia, Canada flourishes in various shades of green. The serenity while canoeing along the Mersey River is calming with the only sounds this woman hears is the water trickling off her paddle as it comes out of the stillness of the river. While canoeing the river, visitors should keep their eyes open as many species of wildlife frequent the banks of the river looking for food or something to drink. Anyone can enjoy a day canoeing the river while visiting Kejimkujik National Park in Nova Scotia as there are rental places along the banks. People are required to bring their own necessities on their canoeing adventure such as sun screen, a hat, snacks and water with the rental places supplying the lifejackets, oars and boats. 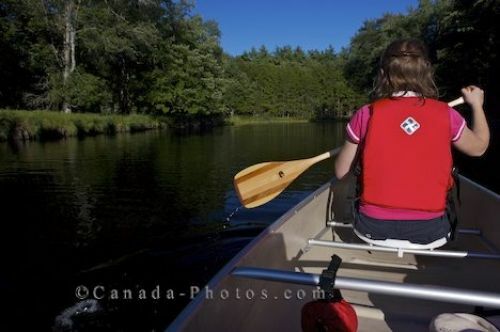 Picture of a woman enjoying the scenery while canoeing along the Mersey River in Kejimkujik National Park in Nova Scotia.